Tomorrow, Disquiet TV opens its virtual doors to the world, presenting a whole new way to view concerts. Live from the Muziekgebouw aan ’t IJ, Disquiet TV presents a unique interactive stream of an evening based around Michel van der Aa’s multimedia spectacle Up-close. 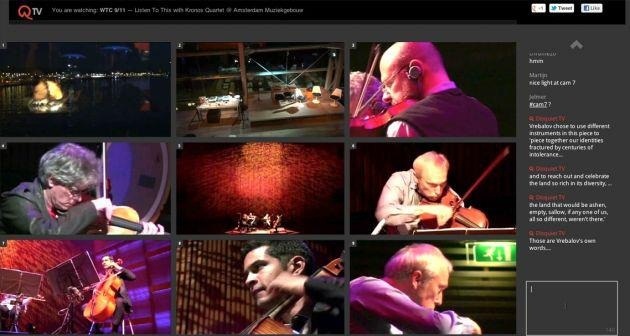 By using nine small remote-controlled cameras, Disquiet TV creates a ‘virtual concert hall’ to showcase the best in live contemporary music. Visitors can chat with others, choose which camera they’d like to view the event through and can even chat with the cameras themselves. Want to join and watch too? All you have to do is save yourself a seat by registering on Disquiet TV’s site. The first public event presents a composer portrait of Michel van Aa, centred around his recent work Up-close. The first performances of this thriller-like work, played by the Amsterdam Sinfonietta, received rave reviews from audiences and press alike: ‘Hauntingly beautiful’, The Guardian; ‘An exciting, complex dialogue between film, electronics and live music’ Hamburger Abendblatt. The concert is completed with three other works by Van der Aa – Imprint, Memo and Oog. Up-close | trailer from Michel van der Aa on Vimeo. The concept of Disquiet TV was born from the wish to reach a broader audience and to use the infinite possibilities of the Internet to create a new interactive and live music experience, unhindered by geographical restraints or uncomfortable concert etiquettes. No other concert streaming service gives its audience this amount of freedom or possibilities. Broadcasts are free – viewers need only register with their email address after the first ten minutes. At least five more streaming events are planned for this season. Where: Muziekgebouw aan ‘t IJ, but can be watched on computers worldwide.